Here’s the cinchy part: After you have cloud storage set up on your laptop, synchronizing files is a snap: Simply copy the files you need to access to a cloud storage folder. Perhaps an example is in order? Choose Save As on the left side of the windows. Choose Documents from the list of recent folders. If you don’t see the list of recent folders, use the Save As dialog box to locate that folder. Use the Save As dialog box to name the file. Or use other controls to create a new folder (on cloud storage) and other Save As dialog box tasks. Click the Save button to save your document. Saving a document on OneDrive storage. Because the file was saved on cloud storage, it’s synchronized with the Internet. Eventually, all your devices that use cloud storage will be able to access that file. As an alternative, you can create the file anywhere on your laptop’s storage system. To synchronize, copy the file to a cloud storage folder. That’s all you need to do! Windows automatically synchronizes the file. You can use any cloud storage folder on your laptop’s storage system, including Google Drive, Dropbox, and others. As long as the file is copied to a cloud storage folder, it’s synchronized. 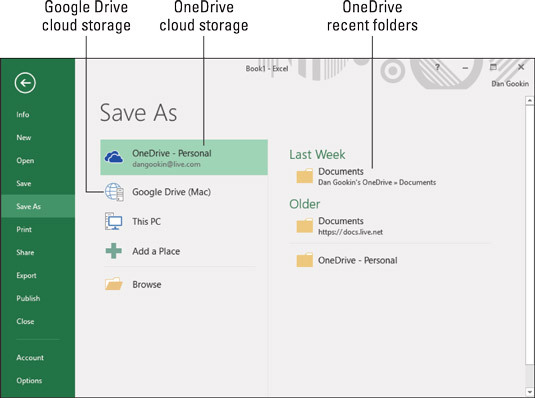 The advantage of OneDrive is that it’s well-integrated to Microsoft Office. Still, you can browse to your Google Drive or Dropbox folders to synchronize files on those services. Although creating a shortcut to a file works on your laptop, shortcuts copied to cloud storage do not work. Always copy the entire file to share it on cloud storage.